Sadik Esener, Ph.D., is the engineer tapped to lead a major new cancer early detection program at the OHSU Knight Cancer Institute. Medical science has come up with only a few ways to detect incipient cancers in healthy people. None of them can distinguish the aggressive, life-threatening cases from those that are unlikely to become lethal. “It’s our view that this is one of the biggest unmet needs in cancer,” says Brian Druker, M.D., director of the OHSU Knight Cancer Institute. Solving the problem will require unusually broad thinking and fresh perspectives. Perhaps it’s no surprise, then, that Druker and colleagues have chosen an electrical and computer engineer to lead a major new initiative on the precision early detection of life-threatening cancers. With $1 billion in hand from a record-breaking philanthropic campaign initiated by Nike co-founder Phil Knight and his wife Penny, the Knight Cancer Institute is creating a Center for Early Detection Research with plans to hire 250 to 300 researchers and a mission to transform how cancers are diagnosed. The scientist who will lead the initiative, Sadik Esener, Ph.D., began his career designing computer chips. He made a name for himself developing optical methods for data processing and computer memory. He has been a faculty member in the electrical and computer engineering department at the University of California San Diego since 1987. And as he tells it, he’s well prepared for the new job thanks to a series of coincidences – some fortunate and others tragic – that set a path to the Knight Cancer Institute. It started with a chance invitation from a San Diego venture capital firm to provide due diligence on an effort to use DNA for computer memory. The project didn’t pan out, but Esener made connections that led him to co-found Nanogen, Inc., one of the first startups developing electronic microarray technology for DNA fingerprinting. At that point, Esener says, “I got really excited about biology.” His voice is soft-spoken and accented with the languages of his native Turkey and of France, where he grew up. Not long after that foray into biology, Esener and a student devised a new way to use optical forces to rapidly sort cells in a solution and identify those with cancerous changes. Based on that work, Esener co-founded another company, Genoptix, Inc., which Novartis acquired in 2011. It’s one of a half dozen startups co-founded by Esener or based on technology developed in his laboratories. 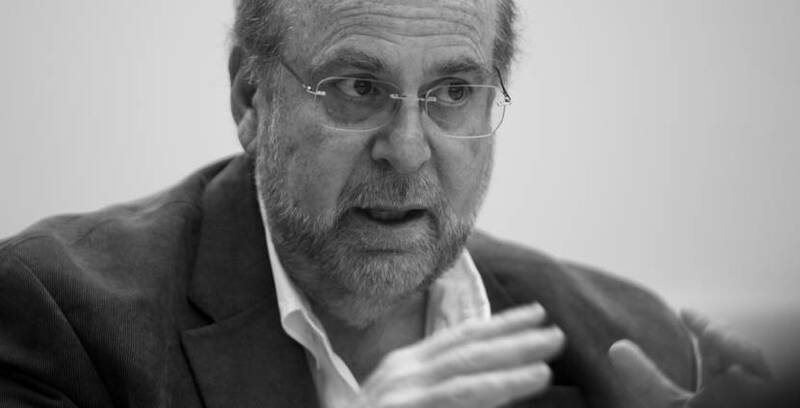 Throughout his career, Esener has made significant contributions in a great variety of fields. In recent years, he’s coauthored papers on nanoparticles for delivering therapeutic cancer vaccines, using microbubbles to isolate tumor cells circulating in the blood, a light-scattering technique to identify microscopic marine organisms, and compact disks that can hold a terabyte of data (1,000 gigabytes). He’s led three industry and university consortiums developing advanced optical applications in computing, and also directed a Center for Cancer Nanotechnology Excellence funded by the National Cancer Institute. Esener’s involvement in cancer research deepened when his wife was diagnosed with colorectal cancer, and soon after his mother was diagnosed pancreatic cancer. The women died within months of each other. Druker says Esener is one of a very small number of scientific leaders with the right combination of skills, experience and passion to lead the new initiative. “Our goal requires that we completely reimagine early detection,” he says. The idea is to leapfrog existing cancer screening technologies, such as mammography and PSA tests, which too often fail to find dangerous cancers while at the same time raising too many alarms about essentially harmless tumors and driving overdiagnosis and unnecessary treatment. “It’s a wide open field that we can pioneer here,” Druker says. Cancer-like cells are surprisingly common in healthy adults, and that complicates the challenge of precision early detection. Autopsy studies, for example, have found breast cancer cells in about 40 percent of women in their forties, but probably only about 2 percent are dangerous.3 Autopsies reveal hidden prostate cancer cells in about one in four men age 60 to 70, triple the rate that prostate cancers are diagnosed in that age group. Overdiagnosis is what happens when altered but harmless cells stand out in an x-ray scan or blood test, prompting unnecessary surgery, chemotherapy or radiation treatment. It’s a mystery why some incipient tumors stay dormant while others run rampant. The answer likely will require a deeper understanding of the ways cancer cells interact with the microenvironment of surrounding tissue to activate growth-promoting signals and avoid suppression by the immune system. 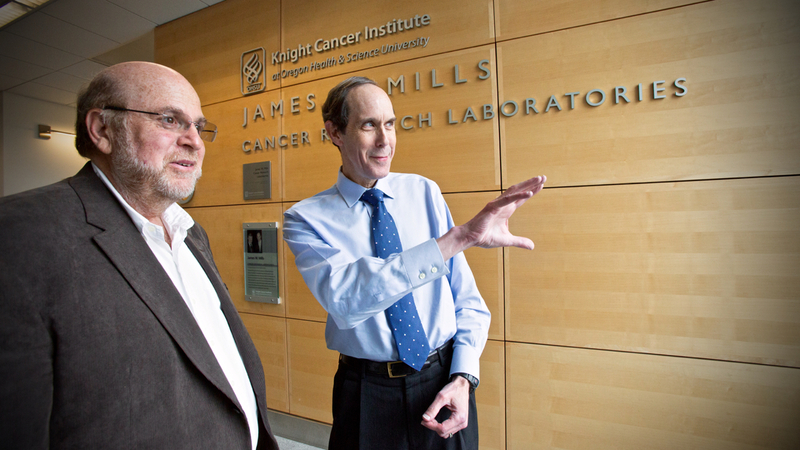 Druker views early detection as a logical outgrowth of the Knight Cancer Institute’s pioneering work on molecularly targeted therapy for advanced cancer. Precision early detection is focused on using molecular knowledge of cancer’s initiating events and early malignant changes to distinguish benign abnormalities from life-threatening nascent cancers – and to find them early enough that treatment can succeed. Druker envisions three key components: biology to pinpoint fruitful targets for early detection; technology to efficiently and accurately identify those targets; and developing study cohorts, such as populations at high risk for cancer, for testing new detection strategies. Esener says the work will require knowledge in electronics, in optics, in biology and in cancer medicine. And it will require a team of people from very different fields who can talk the same language and work effectively together – the kind of teams he’s worked with and led for years. 1. The UK Collaborative Trial of Ovarian Cancer Screening compared annual screening by serum CA125 concentration, transvaginal ultrasound, or no screening. The randomized trial showed nominal reductions in risk of dying from the cancer with the two different methods of screening, but neither achieved statistical significance versus no screening in the primary analysis. 2. Estimates of the rate of prostate cancer overdiagnosis driven by PSA screening range as widely as 20 percent to 80 percent of screen-detected cancers. Narrowing the range, a notable 2009 study using three independently developed mathematical models of prostate cancer progression calibrated to SEER incidence data estimated that 23 to 42 percent of screen-detected cases are overdiagnosed. 3. In a Danish autopsy study, Danish researchers performed extensive histopathologic breast tissue examination and correlative specimen radiography and found in situ cancers in 13 of the 33 deceased women age 40 to 49 years, or 39 percent. In that age group, breast cancer manifests clinically in about 1.5 percent of women in the U.S.
Kanser tedavisi hakkında projem olup burs arz ediyorum.